The Cambridge Guide to Jewish History, Religion, and Culture is a comprehensive and engaging overview of Jewish life, from its origins in the ancient Near East to its impact on contemporary popular culture. The twenty-one essays, arranged historically and thematically, and written specially for this volume by leading scholars, examine the development of Judaism and the evolution of Jewish history and culture over many centuries and in a range of locales. They emphasize the ongoing diversity and creativity of the Jewish experience. 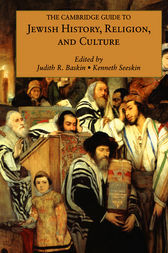 Unlike previous anthologies, which concentrate on elite groups and expressions of a male-oriented rabbinic culture, this volume also includes the range of experiences of ordinary people and looks at the lives and achievements of women in every place and era. The many illustrations, maps, timeline, and glossary of important terms enhance this book's accessibility to students and general readers.